An analyst got bullish on Model 3 production, and then Tesla announced a round of layoffs. Shares of electric-car maker Tesla (NASDAQ:TSLA) had a wild day, gyrating in response to positive and negative news. 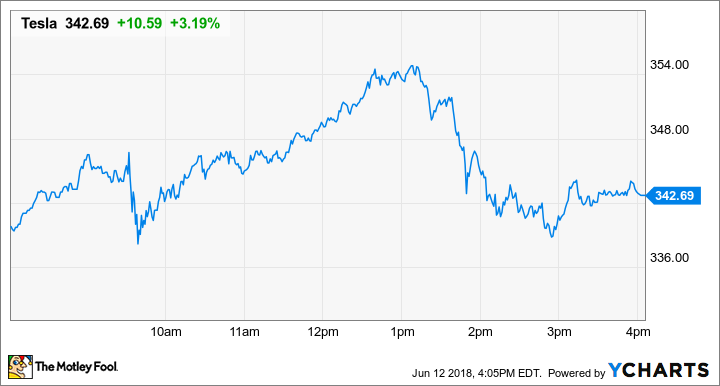 The stock was up as much as 7% during the session, mostly due to a bullish research note from Keybanc analyst Brad Erickson. Tesla is making progress with ramping Model 3 production, according to Erickson, after he conducted checks at Tesla sales centers. Model 3 deliveries appear to be accelerating more quickly than expected, with Erickson bumping his estimates for the second quarter up to a range of 30,000 to 35,000, compared to a prior range of 20,000 to 25,000. Keybanc reiterated its sector weight rating, but investors were encouraged that Tesla may be overcoming Model 3 production delays, which have been a major overhang. And then the bad news hit. The company is laying off approximately 9% of its workforce. CEO Elon Musk made the gloomy announcement to employees in a companywide email. Musk is well aware that his companywide emails often leak to the media and decided to share the internal email publicly after it had already leaked. Tesla had said in May that it was undergoing an internal reorganization where it would be "flattening the management structure to improve communication." Today's news is the result of that reorg. In his email, Musk says that Tesla has grown so much in recent years that some "duplication of roles" has occurred, which "are difficult to justify today." The layoffs will help Tesla reduce costs in the pursuit of profitability; Tesla's outlook calls for the company to be profitable and cash flow positive on a GAAP basis in the third and fourth quarters. Musk notes that the reductions will be concentrated among salaried employees, meaning that no production associates will be impacted, nor will Model 3 production targets. Tesla had 37,543 full-time employees at the end of 2017, according to its annual report, suggesting the layoffs will impact over 3,300 workers (before considering hires made thus far in 2018). The figure is comparable to the roughly 3,000 SolarCity employees that Tesla laid off in 2017 following that controversial acquisition. Operating expenses in the first quarter were just over $1 billion, which led to a $710 million net loss attributable to common stockholders. That included $142 million in stock-based compensation expense. Musk underscores the need for Tesla to become "sustainably profitable," acknowledging the lack thereof has been "a valid and fair criticism" of the company.